The two sanctioned matches I thought I had a chance of winning are over. I didn't do so hot at the IL State match. I smoked MO State. Well, "smoked" isn't really the best was to describe my performance. Maybe it's just me, but in any given match I'm often very happy with the way I've shot a particular stage, but I usually kick myself mentally for the match as a whole (even when I win). 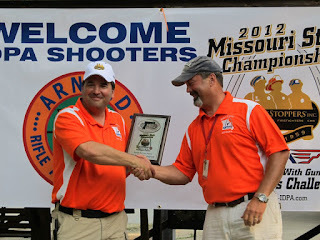 So I did have the top score in SSP at the Match (against 80 SSP shooters) and won SSP Division Champion. I'm pleased, but not satisfied. I continue to make some inexcusable mental errors. SSP Division Champion - ME! First, the mistakes that need to be worked on. I've got gun problem with reloads. I'd guess that at least a fifth of my reloads went wrong. After seating the magazine and closing the slide, the first shot went "click." Nothing. So I had to rack the slide again. Because it was a major match and everything was happening so quickly I couldn't tell exactly what went wrong. I'm pretty sure that racking the slide after the glitch did not eject a round, so it may be a magazine problem. But I may not have noticed the round being ejected either. I'm also pretty sure that the slide went back into battery after the reload. I actually replaced my recoil spring last week and I have not had problems with any FTRB at practice sessions. The whole thing's a mystery to me and I need to find out what's going on quickly. When I am the first shooter on a stage I continue to make dumb mental mistakes. I need to slow down, think about the stage, and ask more questions before I shoot first. On Stage #10 (Stage Coach) I was up first. It wasn't a difficult stage, but there was one pitfall that I didn't even consider because I didn't take the time to think about the stage carefully beforehand. There were 18 threats that were scored best one round on paper. You had to shoot one round in each quickly and accurately. I got 1s and 0s on all but one target. But that 3 down cost me a FTN. When I sat down on the stage coach seat to shoot I didn't even think about the danger of an FTN with one shot on each target. Dumb. On another stage I dropped a partially loaded magazine just like I was shooting USPSA. The buzzer went off and I forgot I was at an IDPA match. I picked it up and it didn't hurt my time too much. But that was pretty dumb, too. A couple of seconds thrown away for no good reason. On the positive side, I deliberately tried to slow down a bit on this match. Not much, but enough to work on accuracy since the match itself was filled with targets partially hidden by hardcover. I think it worked. I typically go for speed and suffer a lot of points down. This time I backed off a bit on speed and only got 66 points down for the match. That may sound like a lot, but for this match it was pretty good. All in all, I don't have much to complain about. Winning my first SSP division champion trophy at a major match was pretty cool. Now I have to decide whether I'm going to keep shooting SSP or switch to another division. Tough choices. Life is rough.